French Polynesia: The five-star Bora Bora Pearl Beach Resort & Spa with Mount Otemanu beyond. 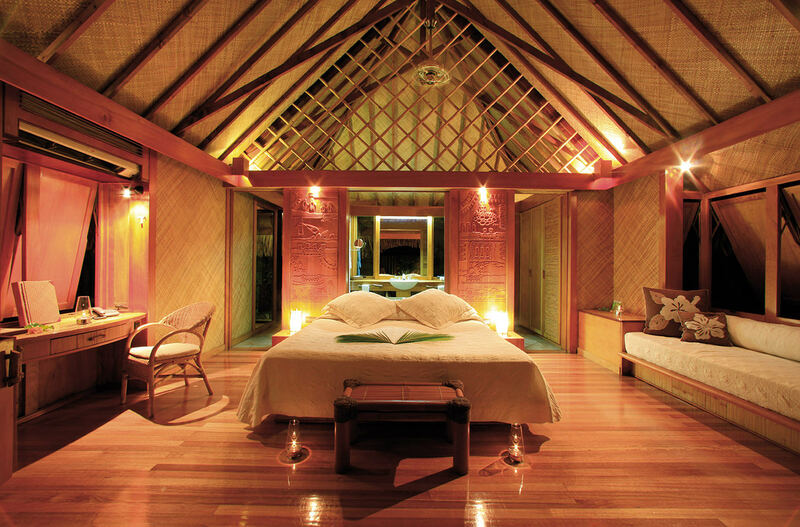 French Polynesia: Bora Bora garden pool suite, Pearl Beach Resort. 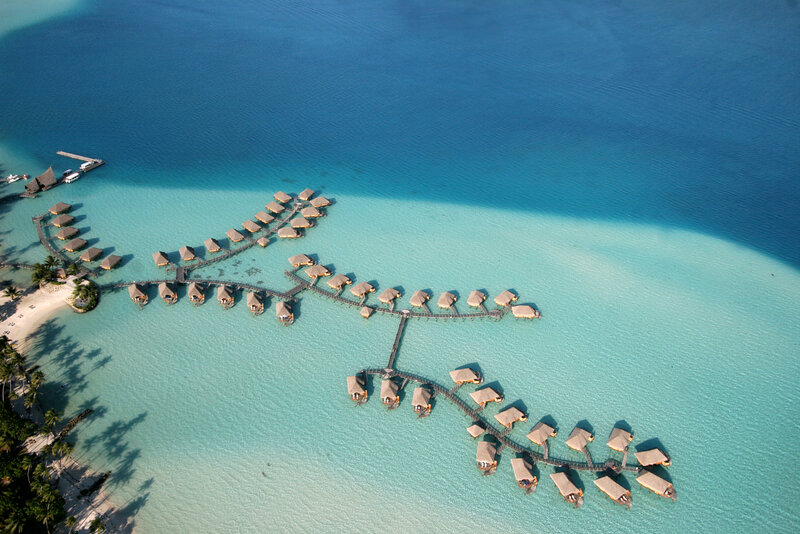 French Polynesia: Aerial view of Pearl Beach Resort, Bora Bora. 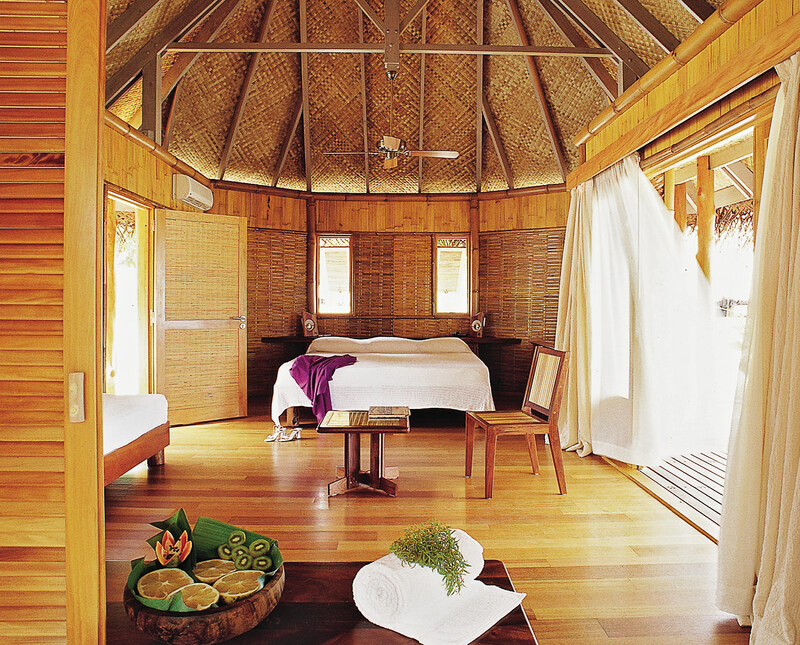 French Polynesia: Natural materials inform the design aesthetic of overwater bungalows at the Tikehau Pearl Beach Resort. French Polynesia: The Garden Pool Suite at Bora Bora’s Pearl Beach Resort. French Polynesia: The lobby of Bora Bora’s Pearl Beach Resort. 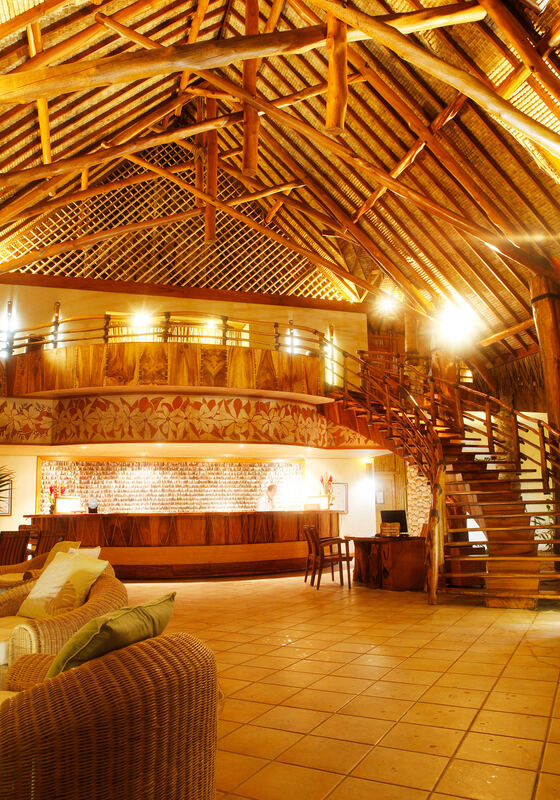 French Polynesia: Inside the lobby of Bora Bora’s Pearl Beach Resort. 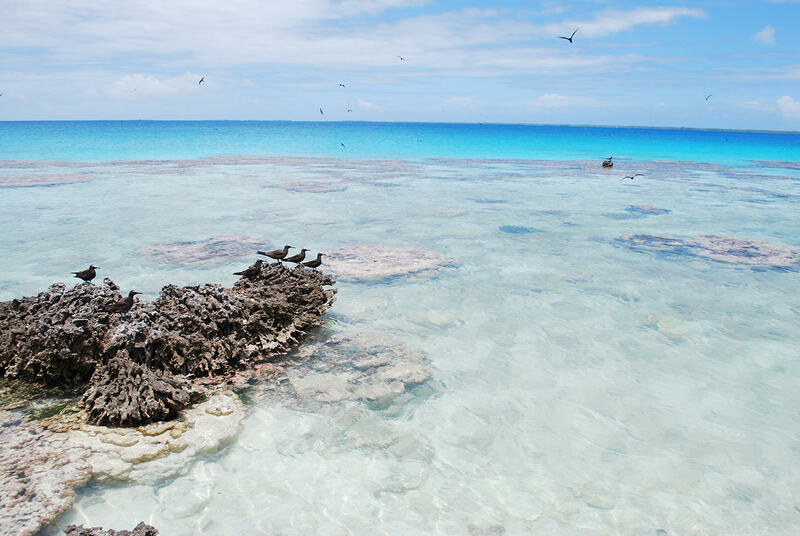 French Polynesia: Bird Island is an avian oasis located off the coast of Tikehau. Photo by Katie Nanton. French Polynesia: One of Moorea’s lush valleys, with Mount Rotui in the distance. Photo by Katie Nanton. 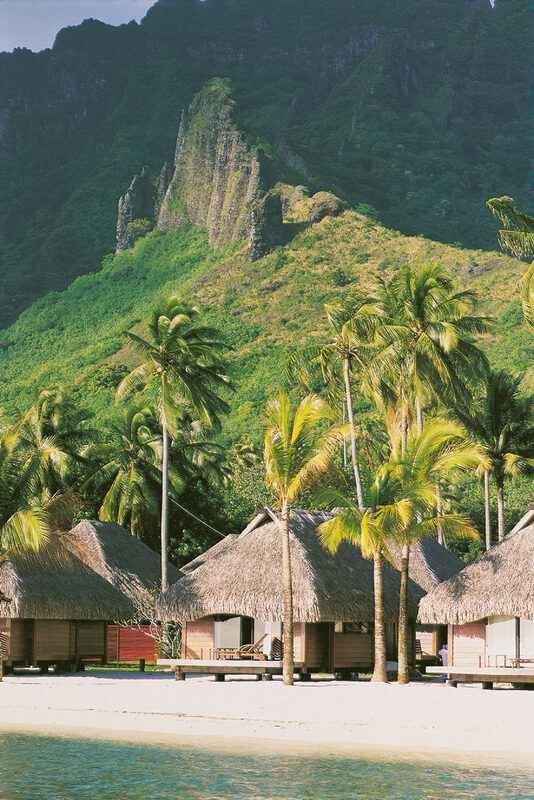 French Polynesia: Moorea’s beach bungalows. 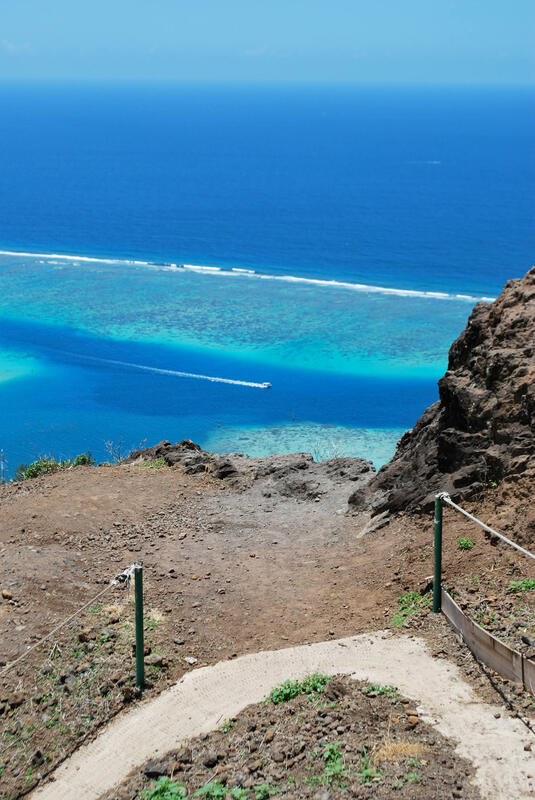 French Polynesia: Cook’s Bay, Moorea, viewed from atop Magic Mountain. Photo by Katie Nanton. Bora Bora, Moorea, and Tikehau in French Polynesia. It could have happened while sailing through the South Pacific toward Moorea, just prior to docking alongside its tangled mountain bluffs at sunset. It may have been while trekking through jungle vines and coral escarpments on a remote slice of land near Tikehau affectionately called Bird Island, with an obscene number of multicoloured birds swooping overhead. Or perhaps it was circling into Bora Bora on an interisland flight, when half of the passengers felt slighted and had to unbuckle their seatbelts to ooh and aah at the vista on the right: Mount Pahia and Mount Otemanu, with their distinct black rock peaks, embedded in the aquamarine lagoons below. It could have been any of those freeze-frame moments on a multi-island voyage in French Polynesia, but at one point somebody said, “This looks just like a Pixar film.” And that it did, in all the technicolour wonder of that animated world. When I fly into Papeete on Air Tahiti Nui, the jumping-off point to 118 of the world’s most beautiful islands, there’s a slight hiccup—a tropical rainstorm in the dark of night. But the next day, one 50-minute flight away from Tahiti, sits a paradisiacal welcome to Bora Bora and a setting that appears painted by an otherworldly brush. Bora Bora—or Pora Pora as we would have known it had Captain James Cook not mixed his letters when visiting in 1769—was also once known as Mai te Pora, which means “created by gods” in Polynesian. The experience of arriving is completely unique: there are no cabs nor chauffeured cars to greet guests—instead, the harbour teems with glamorized water taxis that run the gamut from polished-wood-panelled fishing skiffs to sleek yachts. I seek out the boat emblazoned with the logo for the Bora Bora Pearl Beach Resort & Spa, an 80-bungalow South Pacific Management property that is one of the island’s 14 resorts. Upon arrival, bags are whisked out of hands as quickly as cameras come out of pockets. 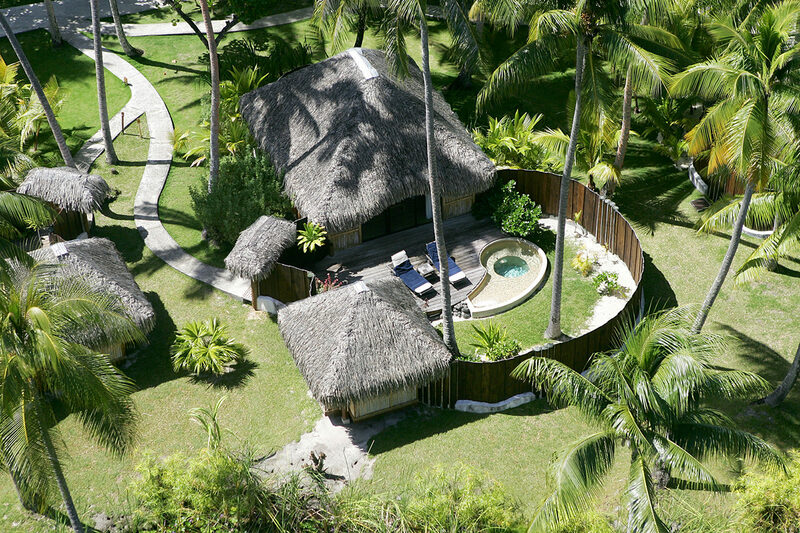 Opened 14 years ago, the five-star resort is a member of Leading Hotels of the World and still retains its position in one of the area’s finest enclaves, situated on a motu (small islet) called Tevairoa with a striking view of Mount Otemanu laid out in front. 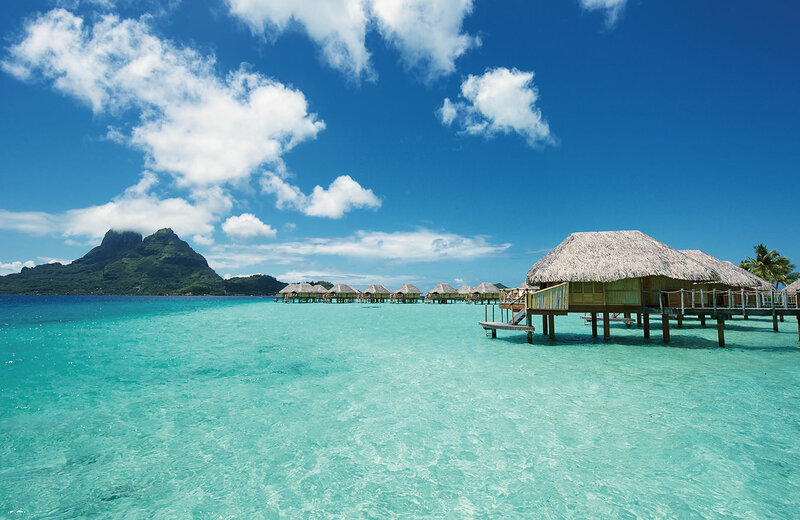 Bora Bora Pearl Beach Resort & Spa’s lavish overwater bungalows are elegantly tacked onto small boardwalk tangents connected to bigger walkways, over which room service also travels by bicycle, while guests snorkel beneath. 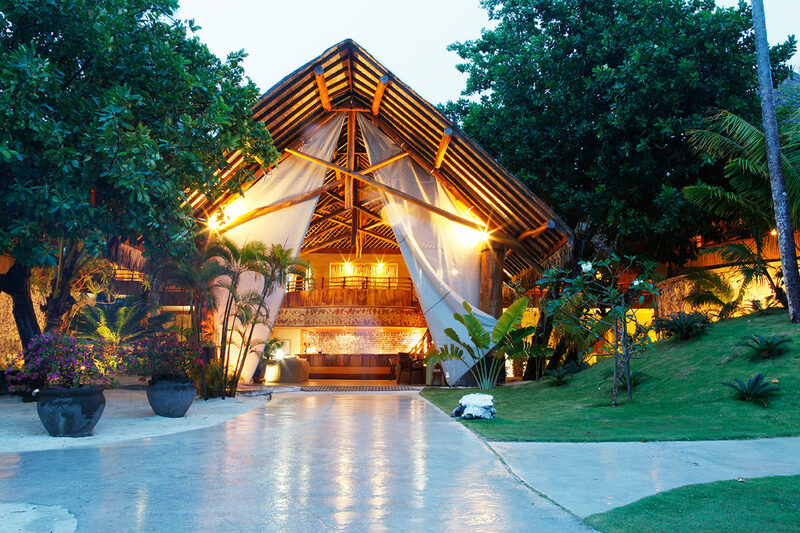 Inside, rustic-luxe furnishings employ traditional Polynesian materials like teak, bamboo, coconut, and woven pandanus palm roofs. When blinds are closed, the room’s focal point is a single square coffee table, covered in glass so the crystalline water is visible beneath and topped by a removable panel for fish gazing, with a light switch to illuminate the underwater world at night. When the bungalow’s glass doors are open, with its private patio backed by the emerald lagoon stretching beyond, the accommodations merge almost synergistically with the surroundings. In two small words: it’s bliss. To break up the pleasant monotony of slipping from wooden deck into waist-high surf and dining on the freshest of fish and occasional French imports like macarons and foie gras, I take a day trip with Lagoon Service Bora Bora to swim amongst manta rays and lemon sharks. The Pearl resides on a reefless side of the island, but about 30 minutes out to sea we locate our first group of large yet harmless yellow-brown creatures. Our guides plummet headfirst into the waters to “pet” their fins, rendering the lemon sharks’ Jaws-like smiles slightly less ominous and working up our courage. Not until a five-year-old boy cannonballs into the water do I realize I’d better jump, too. The experience of arriving on Bora Bora is unique: there are no cabs or chauffeured cars—instead, the harbour teems with glamorized water taxis. One afternoon, back on dry land, a man walks by sporting an intricate jawline tattoo and full sleeves in traditional Tahitian design, an inky giveaway to his profession: he is Tu Hei, the Pearl’s tattoo-artist-in-residence. While Hei does design many Polynesian patterns for guests, his most frequently requested artwork (often for newlyweds) is the white-petalled tiare, a.k.a. the Tahitian gardenia. It’s a recurring emblem found on hotel beds at turndown, strung together in fragrant necklaces, and in body lotions and hair oils at the on-site Manea Spa. Treatments at the spa are doled out as per the rituals of the land—as my masseuse explains, “We don’t walk on your back in French Polynesia—we dance.” One specialty massage involves thick strands of black Tahitian pearls being draped over your back, while another, called the Manoï Maha Rima, is a four-handed massage using rich monoï (tiare-infused coconut oil) that smells of Polynesia and paradise. Playing on the island’s French associations, there is also a full Vichy spa. Though there are air-conditioned fitness areas, not once do I see them in use—everybody, as they should, is swimming. Each isle in French Polynesia varies greatly from the last, making it necessary to travel beyond the best-known one to experience their various fingerprints. 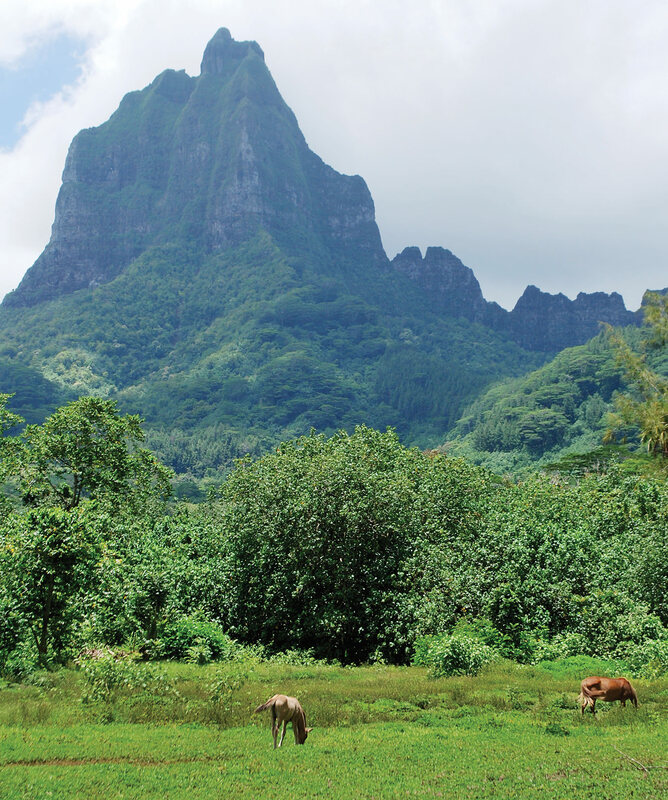 A ferry ride from Papeete is the 200-square-kilometre island of Moorea, mountainous and lush, with pineapple fields and orange groves aplenty. Its various peaks and fertile Opunohu Valley are prime locations for rigorous hikes, including a stunning trip up Magic Mountain, named for the 360-degree view from the summit that overlooks Cook’s Bay. While surfers go to Tahiti and honeymooners buy into Bora Bora, those seeking seclusion peel off to Tikehau, a remote coral atoll that feels like a secret to visit and is praised for its pink-sand beaches. The only full-service hotel upon it is the discreet Tikehau Pearl Beach Resort which, from the air, is no more than a lone, snaking line of overwater villas amidst clichés of endless blue. On this tiny atoll and its surrounding motus, activities are relaxingly akin to watching the avian droves on nearby Bird Island, or listening to the rain on a bungalow’s thatched roof. Tikehau means “peaceful landing” in Polynesian, and riding back to the island one afternoon the skies burgeon with clouds that part, then pour, overhead. A delicate mauve sky hides the sun behind it like a veiled planet of burning light, and then, on cue, there’s a rainbow. Amidst this pure landscape someone says—yes, I’m sure it was exactly then—that this looks just like a Pixar film. Property photos provided by SPM Hotels.